I was shopping at the local farm stand and bakery this weekend and found a delicious treat added to their baked good selection, cinnamon sugar donut muffins. I remember seeing these featured on the Food Network not long ago , so I picked up a few muffins to sample with the family. It was so fantastic I knew I needed to figure out how to make them. After some internet research, I found that the bake shop featured on the Food Network was the Downtown Bakery and Creamery in Healdsburg, California in Sonoma Valley. They are kind enough to share their recipe which I have below. Although, baked these muffins do taste just like a fried cinnamon sugar donut. The muffin is easy to make and eating one or two will make your morning and day, if not your week! From by the bay, wishing you cinnamon sugar food memories! Preheat oven to 350 Degree F. Lightly grease a standard muffin tin. Sift together in a bowl the flour, baking powder, baking soda, salt and nutmeg. Set aside. Using an electric mixer cream butter and sugar together until fluffy. Add one egg at a time, beating to combine. Using a wooden spoon to mix, alternate adding the flour mixture with the milk and buttermilk. Make sure everthing is throughly combined, try not to over mix. Pour the batter evenly, into each muffin tin, filling the cup almost to the top. Bake muffins in the oven for 25 to 30 minutes, until a tester comes out clean. Let cool slightly, and remove muffins from the tin. In a bowl mix the sugar and ground cinnamon together. 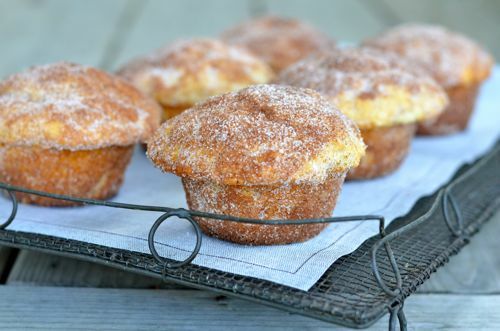 Use a pastry brush to brush each muffin allover with the melted butter and then roll into the cinnamon sugar mixture. Serve warm or cooled at room temperature. This entry was posted in breakfast, muffins and tagged baking, cinnamon recipes, cinnamon sugar, donut muffin recipe, donut recipes, Downtown Bakery and Creamery in Healdsburg California, muffin recipes, Napa Valley on May 25, 2014 by entertainingbythebay.